Has Ranchi university B.ed examination result been published or not? If no then can you tell me in which duration Ranchi University will publish B.ed exam result? You are looking for B.Ed. Result of Ranchi University so following is the link of Ranchi University result page. You can check your result status on this page by enter your specific roll number. When you click on the above link, you would be forwarded to the page having the form as shown in image given below. You need to fill the roll number all in capital letters to get the result. Last edited by Aakashd; July 30th, 2018 at 06:42 PM. And please give me the page and website also. As you required for the Ranchi University B.Ed Result I want to inform you that we have already mentioned complete information about the result on our website. You can get the complete information by clicking on the link given below.. I want to see my B.Ed. 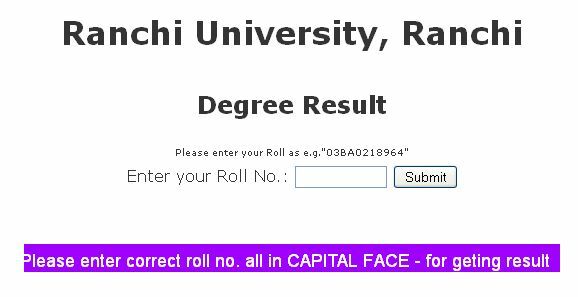 result of Ranchi University so how can I see it? You want to see B.Ed. result of Ranchi University so as on 5th April 2013 there is no any B.Ed. result available on result page of Ranchi University official site. Whenever this result will publish you can see by click on Examination Result given on left side of University official home page. After this result page will open where you will get its result whenever it will publish. Given screenshot is of Ranchi University Result Page. my B.Ed is finished on oct.2013, still result has not come yet. kindly let me know when it will publish. and how much days it will take to get marks sheet. without that i cant go for M.Ed. please reply me as soon as possible. from all other places forms are being distributed for M.Ed and the time periods are 1st week of feb,2014. Ranchi University is a university in Jharkhand state of India and it was established in 1960 and it is affiliated to UGC. Here i am providing the process to reach the result page. Go to the official website of Ranchi University. After that click on Examinations which is on the top. Click on the particular link, you will get the result in the PDF format.